Our Diabetology Department provides comprehensive in-house patient and outpatient facilities and is run by a highly qualified and experienced team of doctors. The department is highly equipped to undertake managing and supervising of diabetes mellitus and thyroid disorders. Our Diabetology department is also equipped to handle disorders associated with the pituitary, adrenal, para-medic thyroid and reproductive endocrinology, especially complicated secondary & tertiary care, adult and adolescent diabetes treatment, insulin pump therapy, gestational diabetes management and lipid and metabolic disorders. We have established a reputation for our capabilities in dealing with complicated lipid disorders, obesity and nutritional problems. The Department has a detailed bariatric and metabolic surgery programs. We have a team of most experienced and expert professionals who pioneer in minimal access surgical techniques like laparoscopy and endoscopy which enables faster recovery, include fewer complications and need minimal post-surgical follow-up. We provide advanced laparoscopic, billiary/pancreatic and colorectal, oncologic procedures and are among a handful of centres to provide scar less minimal access surgery options enabled by the latest technology. We execute bariatric surgeries on obese patients to help them achieve consequential weight loss when an instituted exercise and diet program does not provide beneficial results for these patients. This generally helps them overcome co-morbid issues like hypertension, Type 2 diabetes and obstructive sleep apnea. Our team also conducts open surgical procedures wherever required. We have a team of best surgeons for Bariatric surgery in India for you to consult before the surgery. The Department of Internal Medicine facilitates extensive fundamental care services in an outpatient setting in addition to providing care to hospitalised patients distressed from a wide range of illness. The department is well equipped to medicate chronic health conditions like diabetes and heart diseases, manage critical conditions such as respiratory infections and joint pain. Our Internal Medicine panel is composed of Board Certified physicians, geriatrics and paediatrics, nurses, medical assistants, and expert support staff. Diabetic foot ulcer is an open laceration that occurs on the bottom of the foot in patients suffering from diabetic conditions. Foot ulcers due to diabetes often result in non-painful lower extremity surgical removal. However, the growth of a foot ulcer is preventable with proper control and care. 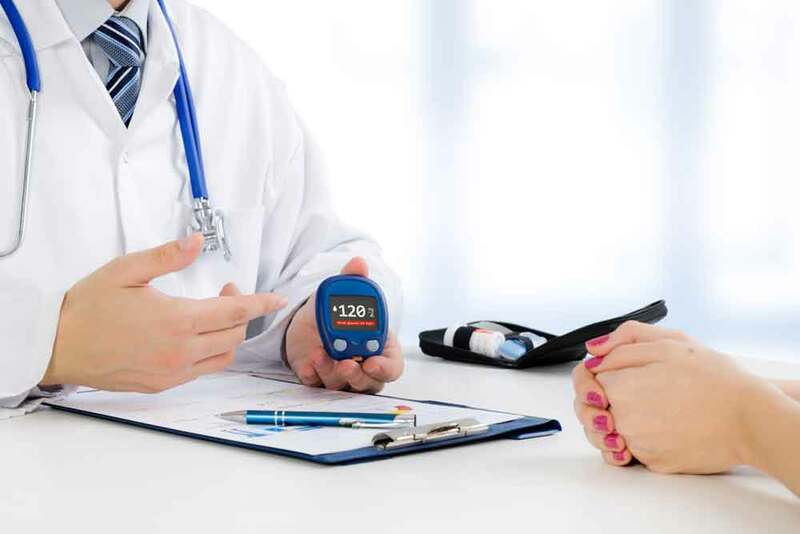 At Fortis Escorts, our expert team of professionals assures best nursing and care for the patients with diabetic conditions and prevents need for surgical rectification by establishing proper care and guidance. Fortis facilitates special centre for the most advanced diabetes technology. The centre aids insulin pump and Continuous Glucose Monitor (CGM) test for monitoring glucose levels in your body and also helps in instituting the daily lifestyle of diabetic patients. The A1C test is a commonly used blood test used to diagnose type 1 and type 2 diabetic conditions and then to monitor how well your body is managing it. The A1C diabetes test is also known as glycosylated haemoglobin, glycatedhemoglobin, hemoglobin A1C and HbA1c. The A1C test result indicates the average blood sugar level of your body for the past two to three years. Particularly, the A1C test measures what percentage of hemoglobin is coated with sugar (glycated). The higher your A1C level, the weaker is your blood sugar control resulting in higher risk of diabetes complications. The glucose challenge test monitors your body's reaction to sugar (glucose). This test is done during pregnancy to scan for gestational diabetes, diabetes that develops due to pregnancy. The glucose challenge test is done in a two-step process. First, you drink a sugary solution. Second, an hour later, your blood sugar level is recorded. The result indicates whether there is a possibility of gestational diabetes. If the test results are not within normal level, further testing may be required to determine the diagnosis. The glucose tolerance test, or the oral glucose tolerance test, is also done to measure your body's response to sugar (glucose). The glucose tolerance test is most commonly used to check for type 2 diabetes. Glucose tolerance test is a modified version of the glucose challenge test used to detect gestational diabetes. This therapy includes breathing sterilized oxygen in a pressurized room or concentrated tube. Hyperbaric oxygen therapy is the most commonly used treatment for decompression sickness- an accident of scuba diving. Other disorders treated with hyperbaric oxygen therapy include severe infections, air bubbles in your blood vessels, and wounds that won't heal naturally due to diabetes or radiation injury. In a hyperbaric oxygen therapy chamber, the air pressure is increased by three times than the normal air pressure. These conditions lead to your lungs inhaling more oxygen than what would be possible to breathe pure oxygen at normal air pressure. Your blood carries this oxygen throughout your body, which helps your body to fight bacteria and stimulate the release of chemicals like growth factors and stem cells, which aid the healing process.